The jail was constructed in the 1770's and housed prisoners until its closure in 1927. During that time, 55 people were executed at Bodmin Jail. Bodmin Jail claims to be "UK’s Most Haunted Venue", according to their website. The Jail is reputedly haunted by Selina Wadge, who was hung for the murder of her youngest son in 1878. Witnesses have described her as wearing a long white dress, and being in a distressed state. It is claimed that she likes to reach out to children. According to Peter Underwood, other visual phenomena include "vague forms". Audible effects include the sounds of rattling keys, footsteps and voices, whereas witnesses claim to experience feelings of "depression and utter despondency" at the jail. 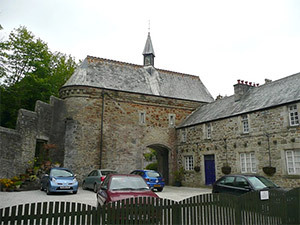 Pictured left is the entrance to Bodmin Jail courtesy of Humphrey Bolton. Bodmin Jail appeared on the TV program, Most Haunted. The episode featured in Series 6 (2005). 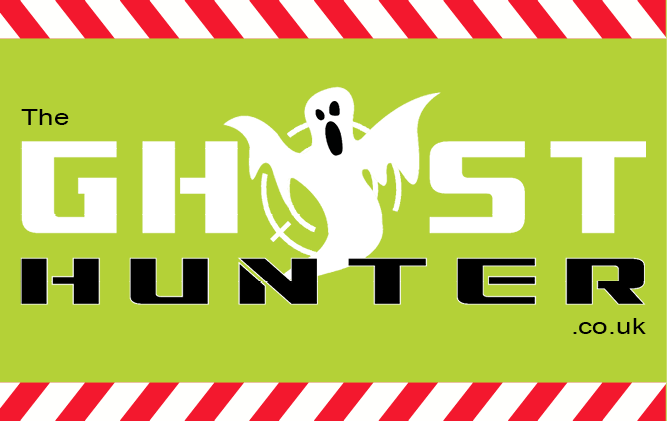 For further information, please read Haunted Britain by Richard Jones and Ghosts of Cornwall by Peter Underwood. 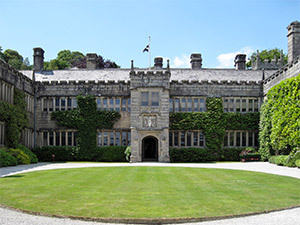 Lanhydrock House stands in 890 acres above the River Fowey. Much of the present house dates back to Victorian times but some sections date from the 1620's. It is a Grade I listed building and has been owned and managed by the National Trust since 1953. It is open to the public. A number of ghosts are reputed to be seen at the house. These include a "dapper gent wearing Victorian clothes"; a Grey Lady; and a man who was allegedly hanged outside the Gatehouse by Royalist soldiers in the 17th century. There are also reports of the smell of cigars and the sounds of children laughing. Some paranormal investigators from the Paranormal Research Organisation claim to have recorded sudden temperature drops during an investigation in 2004. They also reported "orbs" on camera (however, please see research by Para.Science that suitably explains the normality of such anomalies). Pictured left is Lanhydrock House courtesy of Olaf Tausch. For further information, please read Ghosts: Mysterious Tales from the National Trust by Sian Evans and Ghosts of Cornwall by Peter Underwood. 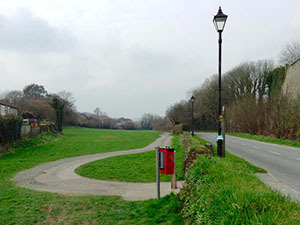 Scarlett’s Well is situated by the beginning of the Camel trail on the edge of town. To locate the well, follow Scarlett's Well Road into the woods and you will find the well on the right hand side. The well was once part of the Priory of Bodiniel and has many stories of healing and miracles associated with it. It is said to have “heavy water” with iridescent colours that would cure most diseases. The well and its immediate vicinity is reputed to be haunted by a lady dressed in white. This ghost has been linked to Victorian times, but some suggest that it is an “ancient folkloric echo of the goddess of the sacred spring”. Pictured left is the east end of Scarletts Well playing field courtesy of Robin Stott. Bodmin (Cornish: Bosvena) is a civil parish and major town in Cornwall, England. It is situated in the centre of the county southwest of Bodmin Moor. Pictured left is a view of Bodmin Jail courtesy of Chris J. Wood. Licensed under CC BY-SA 3.0 via Wikimedia Commons.